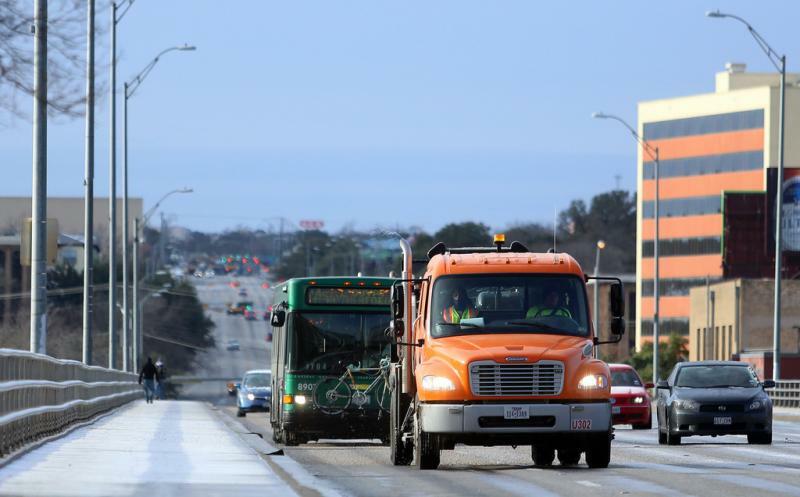 The city and the state cooperated to make icy roads safer for drivers today, sending out a combined 135 trucks to treat some of the 2,000 miles of roads and bridges in Austin. But when it comes to choosing how to treat the ice, Austin Public Works and the Texas Department of Transportation (TxDOT) take very different approaches. The city employs a reusable sand called dolomite, according to Public Works spokesperson Carolyn Perez. She says it's better for the environment than some chemical de-icing agents. Perez said city crews will sweep the streets and collect as much dolomite as possible and then re-use the substance the next time it ices over. But TxDOT relies heavily on magnesium chloride. Crews spray it as a liquid on roads before freezing rain, sleet or snow. Once it freezes, they spread magnesium chloride granules to melt the ice. TxDOT spokesperson Chris Bishop said they believe it’s better than sand. “When you put down sand, you can temporarily increase traction on that, but if it rains on top of that, then the sand is useless, because now you’ve got ice on top of the sand," he said. Magnesium chloride is less commonly used in northern states, because it's "outrageously expensive" compared to salt, according to Michigan Department of Transportation spokesperson Jeff Cranson. "Texas can probably use more magnesium chloride, because you just don't have as many areas that need it," he said.